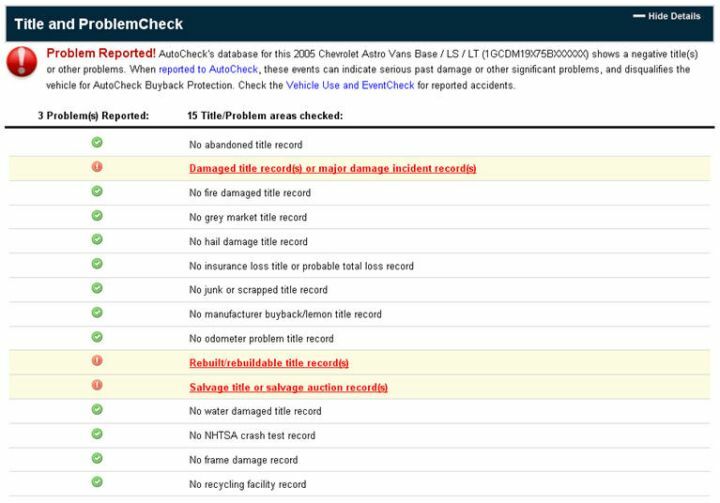 This is a sample which shows you what you can expect to find in a typical AutoCheck Report. The following image illustrates the summary section at the beginning of the AutoCheck report. This section includes the VIN, year, make, model and some trim level details of the vehicle. 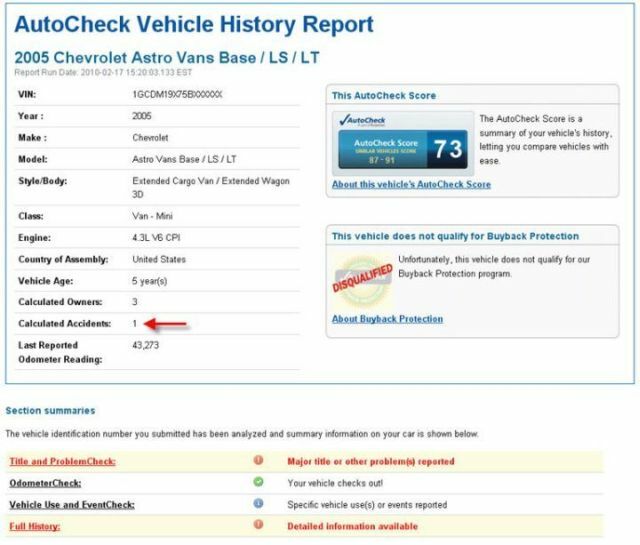 You can use this information to verify that the used car listing is accurate. You will find the AutoCheck Score here. This section also summarizes the data contained in the report and will alert you to potential problems. Note: this example contains accident data. Next, you will see the title history of the sample car. This section of the report will indicate any issues with the car's title. Never buy a used car that has a title issue! The section shown below is the OdometerCheck section. This section of the report will indicate any issues found with the car's mileage records and flag possible rollbacks. 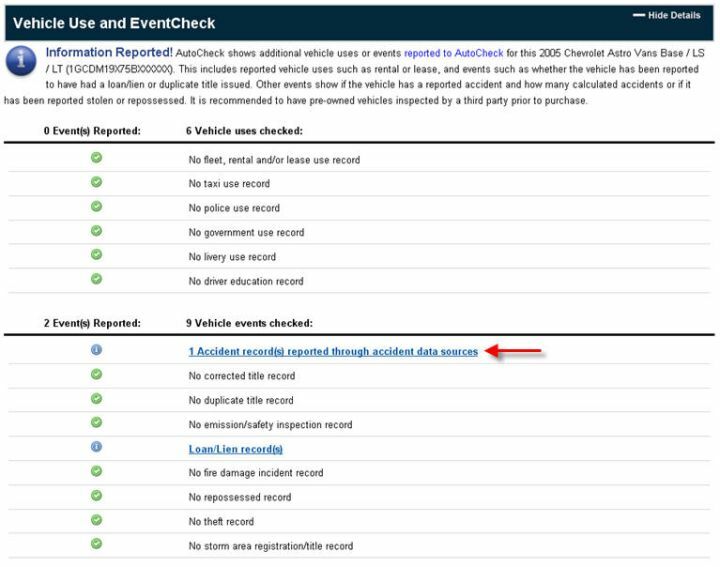 The use and EventCheck shown below is where AutoCheck will indicate any non-title related issues that have shown up in the data. Note the accident event shown. The last part of the report contains the detailed history. This is where you will see all of the data that AutoCheck has for the vehicle. 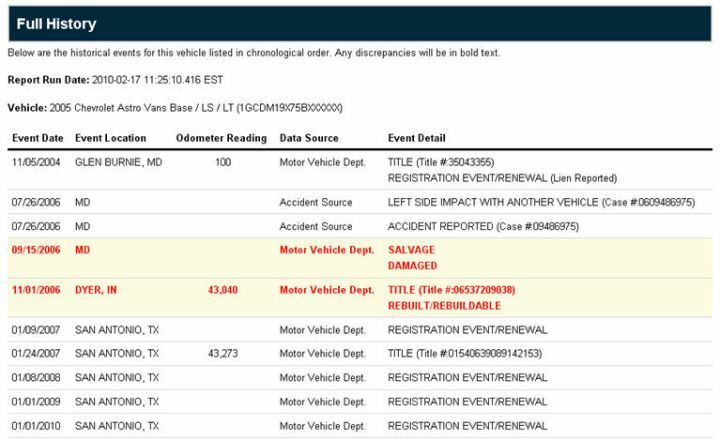 This data can include; original manufactured date, title information, registration information, mileage data as well as maintenance data when available.